...because that meat is haggis. Ok, that's not how the Selkirk Grace really goes, but that's how a lot of people view haggis. I brought my Scottish treasure to the "Night of Champions," organized by Amy Middleton and some others and hosted by Jessica and her roommates. It was a social gathering/impromptu talent show unlike any I'd ever been to. For starters, I found out about it through an eVite. I'd been invited to things via e-mail before, and had heard of eVites, but had never actually received one before (and I've been sent three or four more since then--people in New York use eVites. Who knew?). Also, at one point we had about 50 people crammed in a small NYC apartment living room, while leaving enough space for a small stage for the talent show. I was amazed at how many people showed up, and how many fit in such a cramped space. 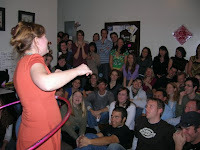 You can get some idea of the crowd in this photo of Amy hula hooping while reciting a sonnet, although there were even more peeps there that didn't fit in the shot. We had some serious performances by some seriously talented people (mostly singer-songwriter stuff by the likes of Yancy and Cousin Rachel, plus some poetry), some guys doing the splits and other crazy physical stunts, Oscar rapped, Gabby spit out an amazing toungue-twister, and lots more. I did my Apollo audition routine (which is why Soo now calls me George or Brother Clooney whenever she sees me). But the highlight of the night, at least for me, was the person who had clearly been planning their talent the longest. 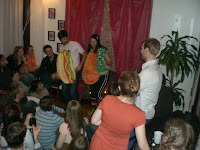 Becca Shim donned a papaya sandwich board, brought up Richard Gordon-Smith as the hot dog (he was just eye candy, really), and belted out "I'm a papaya," her tribute to the fantastic hot dog shop Gray's Papaya sung to the tune of Destiny's Child's "I'm a Survivor." It brought the house down. Even though it was very informal, and except for maybe Becca nobody even knew there was going to be a talent show until just a few days before, I think this one was better than any BYU ward talent show I've been a part of--and I've been a part of some good ones. This is probably one of my top three or four favorite days in New York so far (I haven't made an official list, hence the probably). It was just a really fun day, especially when combined with my earlier search for haggis--oh right, the haggis! Before I started my "talent," I announced that there was a bowl of haggis in the kitchen, and that everyone should try a spoonful, and then peruse the ingredients on the can. In case some of you don't know...haggis is basically the insides of a sheep (heart, liver, lungs, etc. ), mixed with oatmeal, cooked in the sheep's stomach. When it's ready, you cut open the stomach and eat what's inside. It's similar in texture to meatloaf, it's very greasy, and it's usually a little spicy. I wouldn't say I love it, but I definitely like it, despite how unappealing it sounds. Well, there weren't many brave people at the Night of Champions. I'm not sure if any guys took a bite. Richard, who is English, recognized the haggis when he saw it, and began loudly talking about how gross it is. That probably scared a few people away. Several girls tried it, but none were big fans. As far as I saw, only Rosemary did more than just taste it. She actually scooped a small serving into a cup and dug in (but I don't think it's her new favorite food either). I was glad that some people were courageous enough to give it a try, but I didn't mind that I didn't convert any new haggis fans, because there was a lot left over for me to take home at the end of the night. E'en drown'd himsel amang the nappy. O'er a' the ills o' life victorious!" Man, I could go for a good talent show. I haven't been to a talent show... well, since I left a single's ward. Actually, that's not true. We had a pretty cool talent show in our family ward in DC. 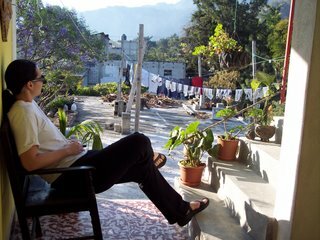 Only wacky talents were aloud (no singer/songwriters aloud), so this one guy (the high priest's group leader) showed us his mad laundry folding skillz (he was freaking good), and this one old chick with tons of kids could actually write left-handed AND right-handed simultaneously. Wickedly awesome. Heckacool. I need to clear one thing up. You are right about a few things. It was a ridiculous awesome party and much fun was had. There were a lot of talents shared and appreciated. Here's where you're wrong, though. I wasn't even going to come to the party until literally hours before when Amy came up with the papaya idea and we rolled with it. All of that was crafted within the 24 hours prior and I think we can all thank goodness for that stroke of genius. Thanks, Amy. Shabba, I remember when you hosted that talent show with Thomas, Weekend Update style. You guys made a good Randy Johnson mullet joke. B-Pet did stand-up. Good times. Becca, I apologize for misrepresenting your performance. Now that the truth is known, that makes it even more impressive.